ESRs in TRUSS are working on novel and advanced theoretical models that will reduce uncertainty in structural safety. However, these models need to be throughly tested on the field before they come standard in engineering practise. When the structures to be tested have the large scale of a bridge and the algorithm needs availability of long data records, the task requires the use of an existing instrumented bridge. 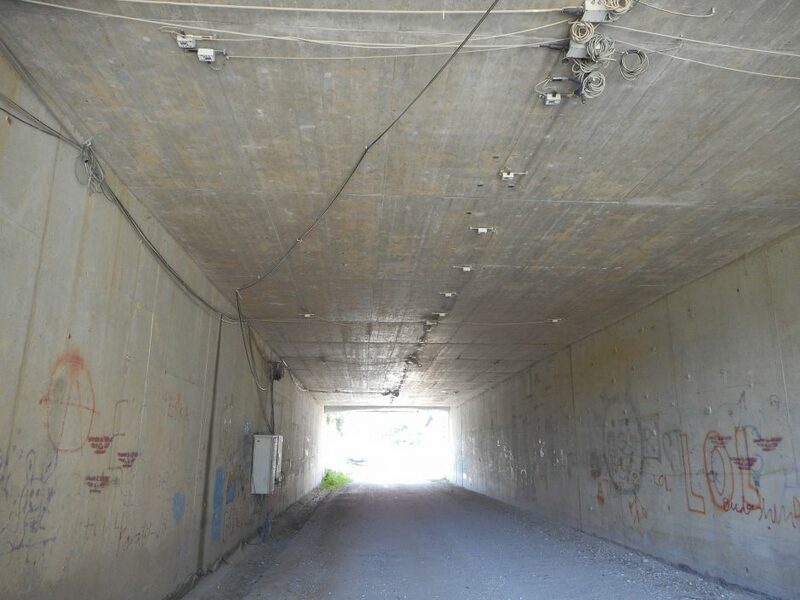 This is the case of the project by ESR8, Barbara Heitner (Phimeca Engineering), who is working on a bridge safety model that quantifies uncertainiy associated to damage indicators via a bayesian updating process. In order to validate her algorithm experimentally, a collaboration has been started with the Slovenian National Building and Civil Engineering Institute (ZAG) and Cestel, who has large expertise in bridge instrumentation and measurement of traffic loads using the bridge response (i.e., a Bridge Weigh-In-Motion system known as SiWIM). It is also very important to become familiar with the features of the monitoring system and to visually inspect the structure under investigation. 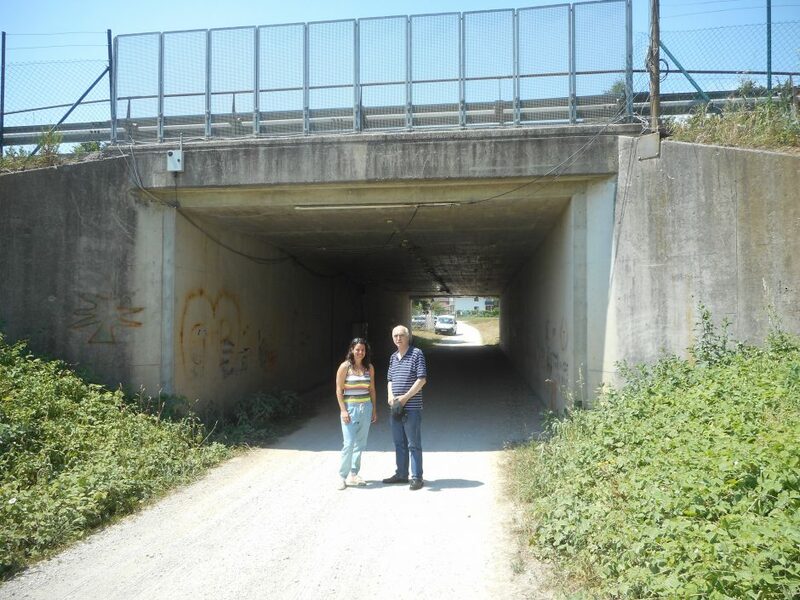 For that reason, on the 23rd June, Barbara visited the Slovenian bridge that she will get data from, accompanied by her academic supervisor, Eugene OBrien, by Aleš Žnidarič from ZAG and by Mitja Pajek and Gregor Jamnik from Cestel, who provided her with details about the bridge, the instrumentation and the measurements. The selected bridge has a SiWIM installation for years now, which is key to the test intended for her algorithm. The bridge is located on the A2 highway between Ljubljana and Villach and located close to Tacen (officially within the municipality of Ljubljana). It was built as an integral reinforced concrete slab bridge in 1985. The length of the span is 6 m and the depth is 0.6 m. It is particularly well suited bridge for weighing trucks in motion from the measurement of the bridge response to their crossing, due to its short span (which makes possible only a few axles on the bridge at a given point in time) and rigid structural form (i.e., small level of dynamic amplification). However, the bridge is relatively wide, i.e., more than 4 times the length (about 26 metres), and a lot of sensors are needed across the bridge section to accurately locate the truck transversely. Currently, there is a 32 channel SiWIM system consisting of strain transducers, temperature sensors and cameras installed in the bridge. Barbara will use raw data from long term monitoring by the SiWIM system (i.e. strain) as well as related temperature data from this site. The data will allow analysing the effect of temperature change on measured strain. It is desirable to check this correlation using the longest possible monitoring period, i.e., 5 years or more.